The reason for Ukraine’s evident unequivocal noncompliance had actually been stated on October 23rd by the country’s President, Petro Poroshenko, speaking in the Southeastern city of Odessa, the city where the Ukrainian civil war had started on May 2nd. It had started when far-right operatives who were paid by an Obama-Administration-connected Oligarch, Ihor Kolomoysky, herded dozens of separatist demonstrators there into Odessa’s Trade Unions Building and then lobbed Molotov cocktails and firebombs into the building and burnt these people alive. The Ukrainian Government refused to prosecute anyone for it, and the U.S. Government and other Western governments didn’t even request them to do so. 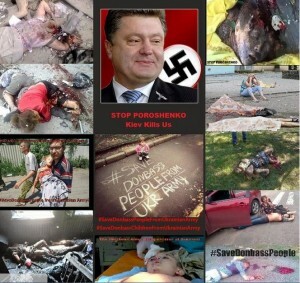 However, this action, which was done unofficially by or on behalf of the new “pro-Western Government” that had only recently been very violently installed in Ukraine on 22 February 2014, was a massacre of regular Odessa civilians who did not like their new, coup-imposed, Government. And on October 23rd, Ukraine’s President went to the scene of the crime, Odessa, and, for the first time publicly, he endorsed it. This new regime had been imposed after an extraordinarily bloody U.S. coup (likewise uninvestigated and uncharged, with the full approval of the U.S. Government), and the people who were burnt alive in Odessa on May 2nd had been opposing it. They had been printing and distributing literature against it. That was their only offense, if such it be. (And that, of course, wouldn’t be any offense in an authentic democracy.) The people who were incinerated represented half of Ukraine. In Odessa and throughout the southeastern portion of Ukraine these were the vast majority of the residents, but after the coup, they lived in fear, and most of them just kept quiet. The people who were incinerated here were among the courageous and bold exceptions. The vast majority of Ukrainians in the entire southeastern half of Ukraine had voted for the man whom the coup overthrew. The fact that now, the leader of the coup-installed regime was even praising as heroes the perpetrators of the May 2nd massacre, would re-spark, and was probably intended to re-spark, and to cow, the mass-fear throughout the southeast, the fear that this new Ukrainian Government really did want them all dead, to such an extreme extent they would now try to finish the job that they had begun and suspended. This statement by Poroshenko was basically a pre-announcement that he would resume the bombing-campaign against the southeast.